Busslingen, October 2013. – An innovative mould for the series production of lightweight fibre composite parts has been developed by Georg Kaufmann AG, Busslingen/Switzerland, within the scope of a joint project that goes by the name of LIPA (Lightweight Integrated Process Application). 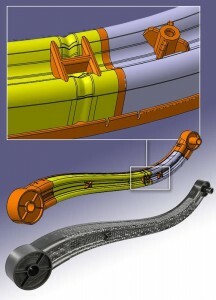 Cut-to-size blanks of Tepex organic sheet – a fabric-reinforced thermoplastic – are first pre-heated and then placed in the mould, where they are thermoformed and at the same time provided with moulded-on ribs, bearing eyes and other working parts with the aid of the long-fibre direct injection moulding process developed by the firm of Arburg, Loßburg/Germany. The result is a lightweight part of extremely high strength and stiffness. The entire production process will be demonstrated at K 2013 (Düsseldorf, 16th to 23rd October 2013) on the Arburg exhibition stand (A13 in Hall 13) on a hydraulic Allrounder 820 S equipped with servo hydraulics. The machine and mould will be producing a demonstration part similar, for example, to a swing arm for a bicycle or a structural element in a car seat. For the production of the demonstration lever, two cut-to-size organic sheet blanks of different thicknesses are gently heated up to thermoforming temperature in synchronism with the moulding cycle of the machine. A robot equipped with a vacuum gripper safely transfers the blanks with a minimum of delay into the mould cavity where they are thermoformed into a W-shaped profile. This not only increases the rigidity of the lever but also ensures a full-surface, firmly pressed, positive connection between the two component sheets. Stiffening ribs and an edging of long fibre-reinforced plastic are then injection moulded onto the organic sheets. As the temperature of the organic sheets is only slightly below the melting temperature of the base polymer, a perfect bond is ensured. For the same reason it is also possible to produce moulded-on elements (e.g. screw bosses) by injecting through the organic sheet without causing any damage to the fibre structure in the moulded part. In order that it can be connected to a mating part in a downstream process, the demonstration lever is provided with a corresponding hole during the moulding operation without adversely affecting the fibre structure. Improvement in the lightweight coefficient through local application of different thicknesses of organic sheet according to the load distribution within the moulded part. Reliable bond between the component organic sheets through full-surface, firmly pressed, positive connection. Creation of hole in the organic sheet without damaging the fibre structure. Encapsulation of the exposed fibres of the cut-to-size organic sheets through a moulded-on all-around edging. Reduction in heat-up temperatures for the organic sheet through minimum temperature loss during the moulding cycle. 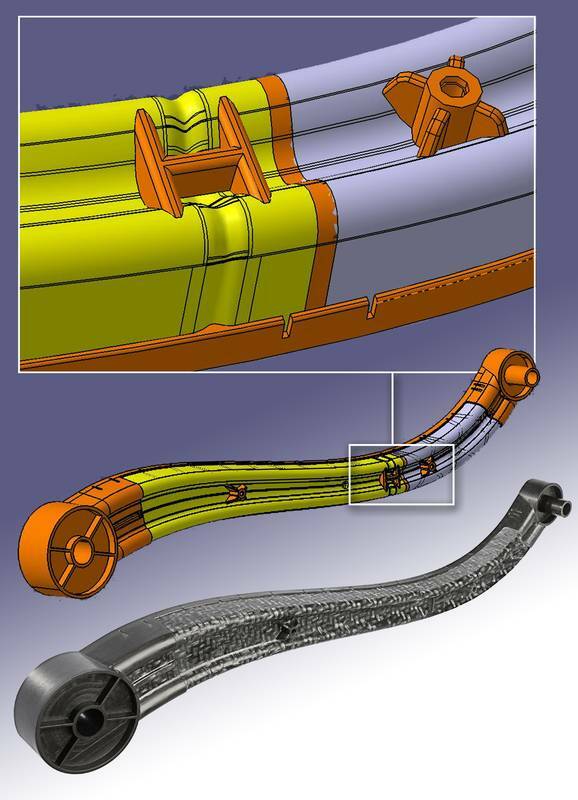 Long-fibre direct injection moulding readily permits flexible combinations of material through variations in fibre length and content. Significant cost benefits offered by long-fibre direct injection moulding thanks to use of cost-saving starting materials.